The study analyzed 130,000 posts and gives first insights on how the newly launched feature is used by the Facebook community. 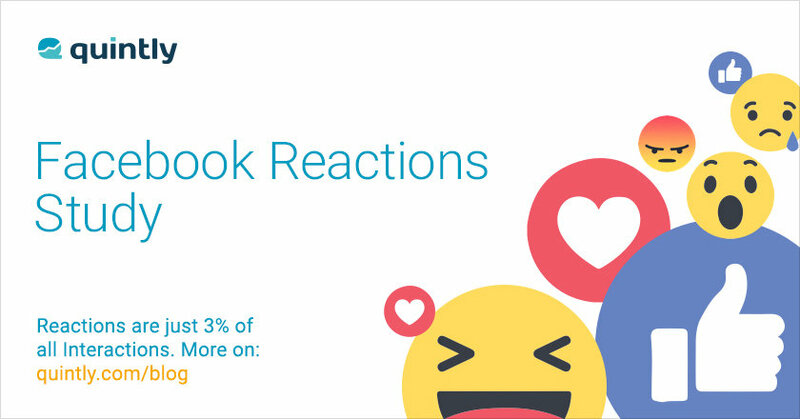 The social media analytics provider quintly just published a Facebook Reactions study analyzing 130,000 posts. The analytics company revealed that Facebook Reactions are hardly used by now. Looking at the total share Reactions are just 3% of all received interactions. As well as that, the study shows that the “Love” emoji is predominantly used compared to other options. Different page clusters make the findings applicable for every marketer on Facebook. To make the study easy to understand, quintly went step by step deeper into the analysis. First, Reactions got compared to Shares and Comments to identify whether they are already important for companies or other interactions are still of higher value. After splitting up the analyzed Facebook pages into different sized groups, quintly looked at post types such as image or video posts.